Like many of my generation, my introduction to Father of the Bride came via the abysmal 1991 remake with Steve Martin. As much as I loathed that version, I didn�t think I should hold this attitude against the original. Indeed, my disdain for the �modern-day� film made me more interested in the 1950 take � it couldn�t be as awful, could it? When Kay Banks (Elizabeth Taylor) gets engaged to Buckley Dunstan (Don Taylor), a virtual nightmare ensues for her father Stanley (Spencer Tracy). First he�s upset that his little girl has grown up, and then matters get worse as he realizes how involved and expensive the wedding will be. Stanley gets more and more worked up as the complexity � and costs � escalate. Readers may notice that the synopsis above duplicates the blurb I wrote for the 1991 film. That�s partly because I kept my overview simple, but it�s also because the two films do stick pretty close to each other in terms of story and character areas. When it comes to how the movies approach those elements, though, the 1950 and 1991 versions differ substantially. The 1991 flick offered lowest common denominator material, as it focused on cheap sentiment and lazy slapstick. While the 1950 edition features emotion and comedy as well, it does so in a much more subdued manner � arguably too subdued, perhaps. The 1950 Bride takes such a dry approach to the subject matter that at threatens to feel inert at times. That said, it does gather steam as it goes. The first act seems too restrained, but the film allows itself to develop greater intrigue � and comedy � along the way. The movie becomes looser and freer with the passing minutes. Not that anyone should expect a rip-snorting comedic romp, as Bride stays pretty low-key � which seems like a positive, especially after the idiotic shenanigans of the 1991 version. While it plays situations for laughs, at least the 1950 film gives the characters dignity and doesn�t turn them into cartoons. Unlike the 1991 flick�s Annie, Kay presents as a reasonable person. Level-headed and practical, she doesn�t even want a big wedding, whereas Annie comes across as a petulant child who demands to be celebrated on her �big day� and to get her every whim granted. This makes a huge difference, as it allows us to connect better with Kay and the rest of the characters. Though the wedding balloons semi-out of control, it never becomes the consumerist obscenity of the 1991 film, a tale in which George � that version�s patriarch � is looked at as evil incarnate because he doesn�t think a wedding should cost more than a home. With a more likable bride-to-be, the 1950 movie allows us to better embrace its characters and circumstances. As I watched the 1991 edition, I got genuinely angry at how superficial and status-obsessed the characters were, especially because we were supposed to be on their side. That factor plays no role in the 1950 flick, and it benefits from it. A greater focus on nuance and reality also allows for a lot of charm to escape. Tracy demonstrates Stanley�s frustrations but doesn�t make him a cartoon complainer. He shows concern for the rising budget but still has a soft side, and we like him for this. I also appreciate the film�s essential lack of mawkishness. Movies like Bride easily turn gooey and sugary, but the 1950 version avoids those traps. Instead, it maintains a nearly clinical tone, one that allows comedy and emotion to emerge naturally and without the relentless prodding I might expect. I will say I think Bride could use a little more energy, but that�s a minor complaint. The movie offers a largely charming little comedy that gives us a timeless look at the �business� of weddings. 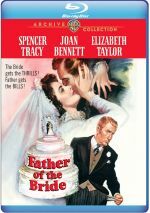 Father of the Bride appears in an aspect ratio of approximately 1.37:1 on this Blu-Ray Disc. This became another terrific presentation from Warner Archives. Sharpness looked excellent. 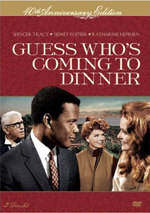 The movie presented a consistently tight and concise image. Only a the slightest smidgen of softness ever occurred; this came in a few wide shots and was negligible. No issues with jagged edges or shimmering popped up, and edge haloes remained absent. I got no impression of digital noise reduction here, as the movie provided a nice sense of light grain. Print flaws didn�t show up in this clean presentation. The black and white image demonstrated solid tones. Blacks came across as deep and rich throughout the movie, and it offered terrific contrast. The film displayed a nicely silvery appearance that seemed appealing. Shadow detail looked appropriately heavy but never came across as excessively heavy. Across the board, this became a wonderful transfer. While not in the same league as the picture, the DTS-HD MA monaural soundtrack of Bride also worked well. Speech seemed reasonably accurate and distinct, with no issues related to intelligibility or edginess. The movie came with minimal score, but the music came across as fairly bright and lively when it did appear. Effects were similarly modest but they showed good clarity and accuracy within the confines of 66-year-old stems. I noticed no background noise or distractions. This was a more than adequate auditory presentation for an older movie. Only minor extras appear here. In addition to the film�s trailer, we get two newsreells. We find �Wedding Bells for Movie Star Elizabeth Taylor� (1:24) and �President Truman Meets Father of the Bride� (1:12). These show the events implied by their titles. Both come without their original audio, unfortunately, which makes them less useful. A likable, endearing comedy, Father of the Bride delivers a lot of charm. Unlike its 1991 remake, it presents situations in a natural, believable manner and allows us to care about the characters amid the laughs. The Blu-ray boasts stellar picture quality as well as pretty good audio but it skimps on bonus materials. The absence of supplements disappoints, but the Blu-ray brings home the movie itself well.